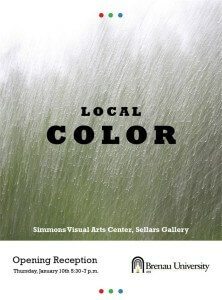 Local Color opens on Thursday, Jan. 10 with a reception in Sellars Gallery from 5:30 – 7 p.m. The show runs through Mar. 9 and normal gallery hours are from 10 a.m. – 4 p.m. The exhibit explores the work of local and regional photographers who have a tie to Brenau University and the Gainesville community. The photographs reveal the “local color” of northeast Georgia through landscape, portraiture and photojournalism.